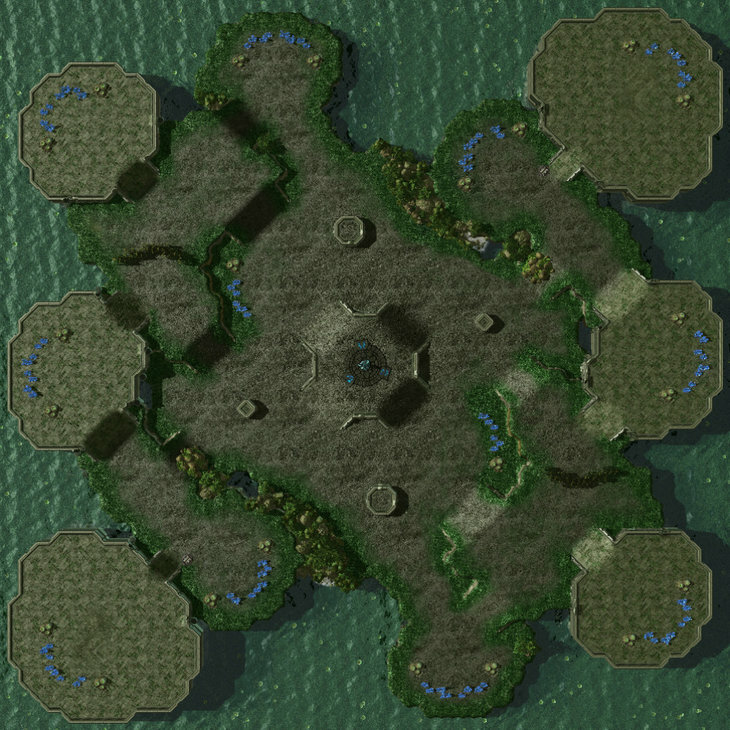 The basic concept in this map is two large highround areas that define the map's centre. The map's focus is movement and area control. 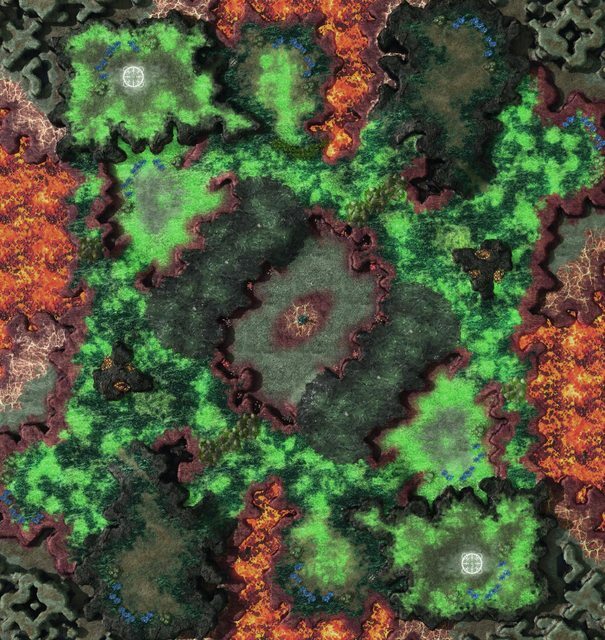 With a setup of 12 bases the map widens with every expansion noteably and emphasizes scouting, positioning and movement. Passivity is not an option. This map is quite massive in scale (158x138) with quite a long rush distance (around 46) and promotes macro play (obviously). Because of the attention of chokes, open areas and level differences, but also highrounds, losb and drop areas I believe the map has some potential for entertaining matches. So far Madsquare really contributed to this map with his detailed analysis. Cheers! This is still WIP and not yet online. I have no problem with changing stuff, so comments on any aspects of the map are very well appreciated! Very WIP, textures are very basic and fairly low doodad work. 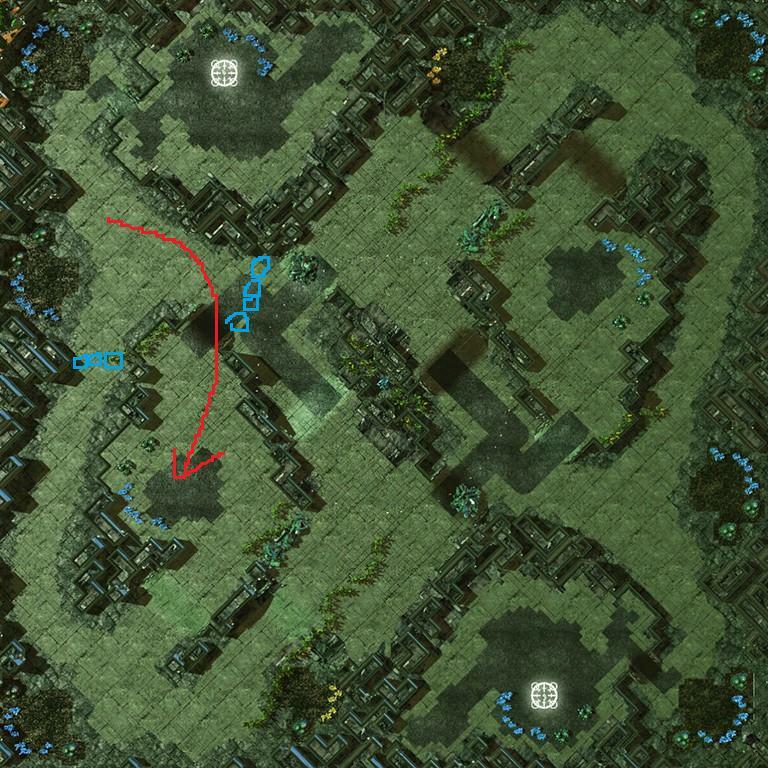 You can circumvent the Xel'naga tower by going the long way around, along the high ground. 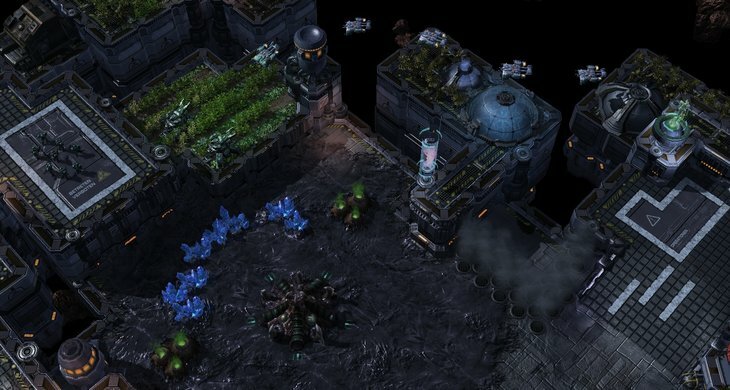 It's fairly large, with several open areas and flanking routes so Zerg may have an advantage in that department, but it shouldn't be too large. Additional choking can be added to the center if necessary. The current name is Psionic Citadel, the story behind which is that the level is a Dominion training facility for Ghost and Spectre operatives as well as advanced tactical weapons. Ghosts, Spectres and Weapon operators are housed in the barrack towers that dot the nearby landscape. In the program's early stages these trainees were in integrated housing, but fights that broke out between Ghosts, Spectres and Operators (which often ended disastrously) forced the three groups to be housed separately. @Samro225am: I really like the aesthetic style, the textures and doodads work very well together. Why have gold minerals as blockers to the natural ramp though? This thread is a great idea! All of my posts have been of WIP, where I'll work on something until it's pretty much at the best of my abilities, and then I'll post it here to try and get some feedback/suggestions for this map or for future reference. None of my maps have been professional quality. 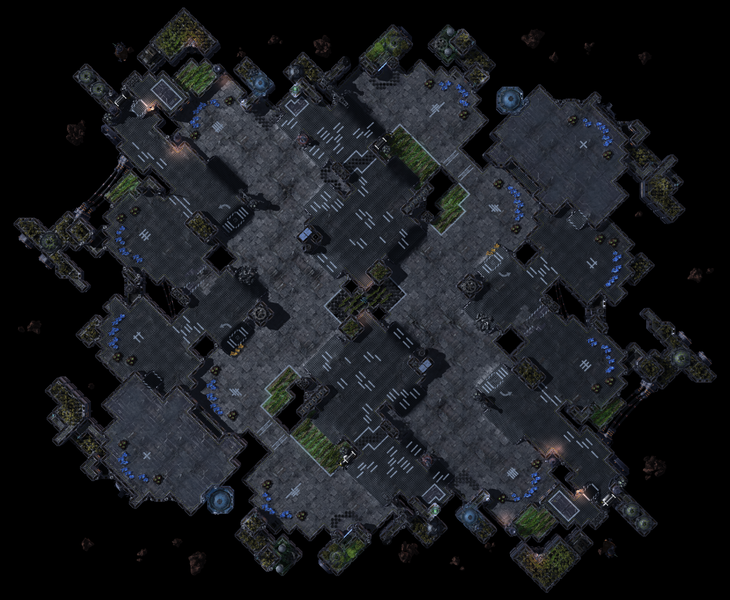 I've noticed improvement in my maps over time, but they're probably not even up to small tournament snuff, let alone GSL/MLG or Ladder quality. I was wishing for a less formal way of showing off maps, so this might just be it! @Coppermantis re Samro: mineral blockers are very defensive because it's highly likely that only the player with a base near the patches will be able to clear them. Gold is to try to make it a little more even between mules and normal workers, I'm guessing. @Coppermantis re map: Something about the way that the map splits bothers me. It's related to circle syndrome because your 5th base is so far away from your main and so close to your opponent's main. I also have issues with the natural but I need to think more about how to say what I mean. @Samro: this map is gorgeous. Could you put the gold minerals on the other side of the ramp so that it would be easier for a defender to get to the low ground third? How many creep tumors does it take to connect the natural to either of the thirds? I wanted to make a less severe low ground middle than I had for Vorpal Shores and the rest sort of flowed in from there. Working title is Rings, and I'm afraid that it might be a little too small (35 second rush distance). I've also received some criticism that the mains are too large, do you guys agree with that? 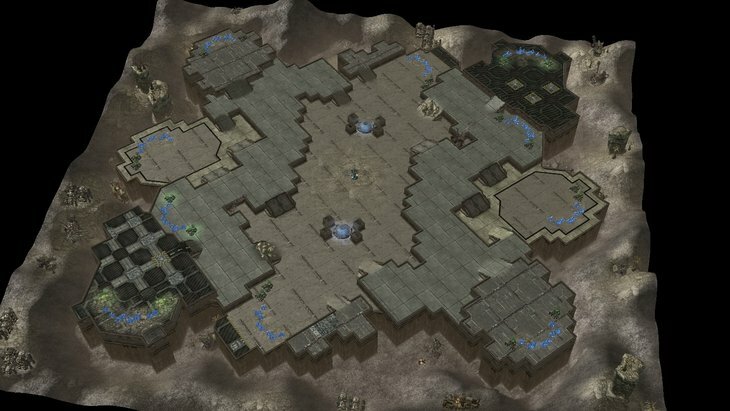 It might suffer from the Korhal Compound low ground third deal, so there is a high ground third that should be a viable option for Protoss or bio Terran. Yeah, I was worried about Circle Syndrome. I was considering removing the fifth and putting the third on the low-ground area between the current hostile Fifth and the Main. May eventually get around to doing that, I still have updates to do on other maps. Regarding your map, I think the mains are an okay size. Perhaps a tad on the large side but not bad. The pre-placed creep is interesting, although it might give Zerg too much of an advantage since, as far as I know, it can't ever be removed. Might not be too big a deal though. Hoping this at least somewhat addresses the issue. I added a high ground edge near the new fourth, similar to the terrain near Condemned Ridge's third, but if this makes harassment too easy then I can remove it. 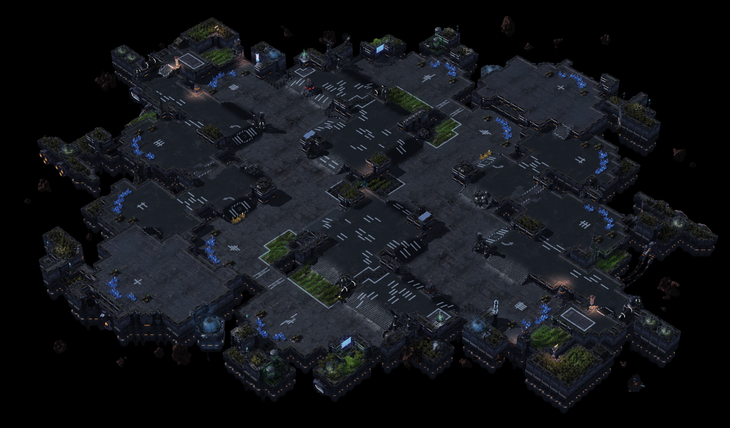 Unfortunately, since no one cares about my maps and I don't have many friends who play Sc2 testing is difficult. In any case, the expansion layout now suffers less Circle Syndrome as what used to be the fourth is now the fifth and the fourth is now as I described it in my last post. Samro: I love how this map has developed. It is coming along nicely. The main thing I don't like now is that the third is harder to take than the fourth. Imo that isn't a very good mechanic because the player who gets ahead by taking the third can get even more ahead with the easy fourth; obviously not a huge affect for PvZ, but it does in PvT and mirror MUs. I'd like the fourth to be harder to defend somehow- even something as simple as making the cliff more accessible (closer air distance to the opponent makes drops easier). Or something like making the ground distance farther. I love this thread so far! I will certainly be posting some WIPs as I make them. this thread is made to be full of images and ideas! Coppermantis: You are heading in a good direction with the changes. Yet the general concept creates - with these two long ledges - a very strong separation. When I think about movement, it feels like it is very restricted and makes everyone turtle in a way, if they want or not. I'd widen the two non-rocked ramps significantly and maybe add another one between central lowground and the ledges. Your changes are good as they make a more diagonal split. As monitor says the space around the third could be used much more efficently and give you soem space to add something special regarding interesting attackpath for lategame. 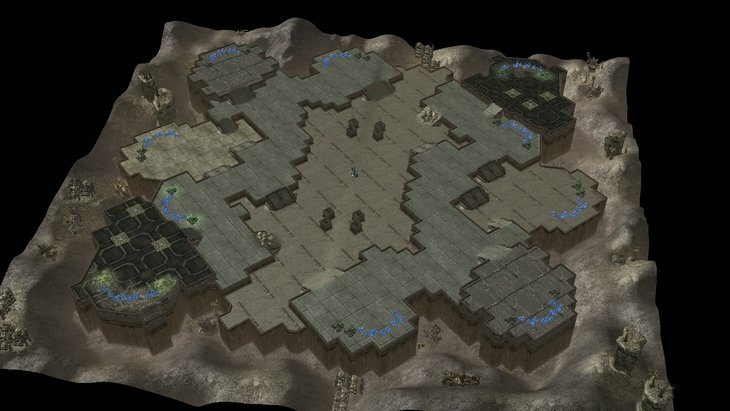 RFDaemoniac: The central bases are quite impossible but in my opinion the highround base is a bit difficult, too because its second entrabnce connects to the space close to the opponent's low third and the plateau from he will likely cover his bases. Overall there are so many small features, i think you have to basically try to make one for each area and also make them stand out in the layout, but also in the texturing. Also I'd widen the map significantly and move the "central base" to the "outside" of the highground third, possibly low, and find a fun solution for how this area connects to the opponents midground (infront of nat). 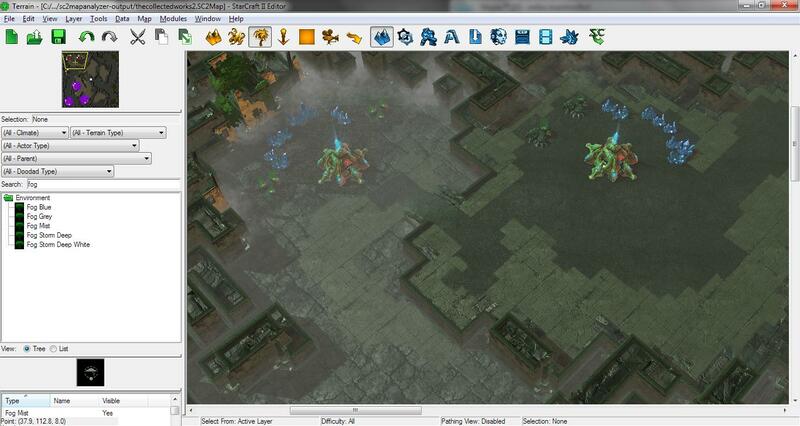 on my own map @ Coppermantis and RFDDaemoniac: It is two creep tumors for each third alternative. Yet the gold minerals are "in the way" of the creep-path. My reasoning for that positioning was rather have the minerals on the outside, to make it easier for the attacker to switch from defending ramp A to ramp B. It is only the defender who can decide if and when this block is taken out. on my own map @ monitor: in the spoiler tag is an image that signifies drop-ability and illustrates the way to the drop. What i will try to do is connect the green drop-pod to the middle highround. I have to find the space to do it, but it is do-able. right now a direct connection feels a bit tight and long. At least i will enlarge the green drop to the right. option 2 - bigger green drop pod with more additional highground surfaces area to fly in. Something that I was trying out for an all spawn 4p map. The concept behind it was making one of the 3rds a forward third to help balance all spawn positions. This is one of those maps that looked great on paper but when I went to make it in the editor it proved difficult to get the proportions right. Pretty much ready to give up on it but thought I would post it on this thread before it gets lost in the dusty caverns of my /maps/WIPs folder. Below is a sketch of some of the changes I might make, largely proportional things to better use the space. A big 4p macro map I've been mulling over or awhile. I have since remade it a few times, but I think the initial concept is still most representative of what I want it to be. Fairly standard 2p map I've been working on for the past few weeks. Really like how it's coming but jeez are the aesthetics tedious. @Syphon8 re Untitled 1: Having only 1 entrance by ground to 4 bases is going to make for very minimal mid games, and then where should one expand after that? Nothing is really defensible after these super protected 4 bases. 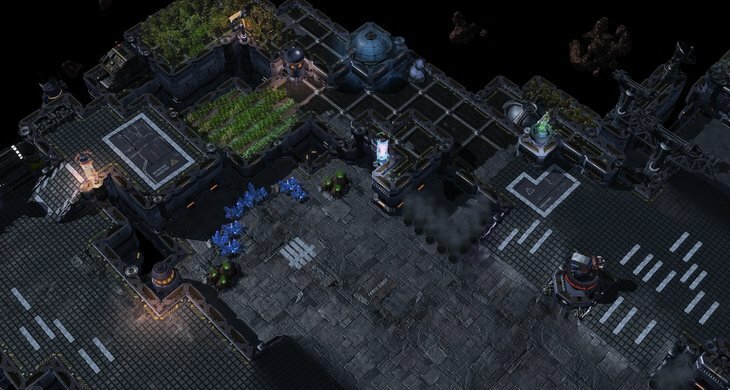 Also with the tower vision is there any way to warp in into the main or in-base expansion? This would be a problem for PvP 4gate fest. I do really like the movement of of the middle. What are the purple lines? @Syphon8 re The Collected Works: I love the cliffing and textures in this map, and the movement through it seems really cool. I haven't been able to fully digest it in the past 5 minutes, which is a great thing! The difference to hold your third and fourth seems too great to me, but I'm not sure. The low ground corner base is terribly far away and the high ground one is awkward to get to. While I love the LOS near the gold, I'm not sure if anybody will ever be able to take this base. It's ridiculously far from by ground from the main that it is so close by air to. This area also seems like it would get enough action anyway because of an army moving back and forth between the fourth and fifth bases. With the main, can reapers/colossi get in and out on the inner side? I like to leave some room for reapers because they get so little use in the current metagame. @OxyGenesis: I think you're on to something here. This feels like an aggressive 4p map, whereas almost all others are pretty defensive (Tal'Darim, Metropolis, Whirlwind, etc). I agree that more proportion work would help. Don't give up! I've been having issues with proportion myself and thus don't feel comfortable giving specifics in this area. @Coppermantis: I agree with monitor that more ramps would help the split. I like this low ground expansion and it makes me like the natural more. Part of my issue is that the rocks block the closest path between bases, but are so close to each base that it makes killing them as an attack worth it. The rocks on Daybreak really slow an army down that wants to go through the middle, so much so that it's not worth it until 16:00+. Here as an attacker I can be pressuring and then in one of the lulls where I have to pull back, kill those rocks to make reinforcing easier and open up another attack path. I feel like this would make it hard to defend 1 base pushes on 2 base, particularly in PvP and TvP, maybe also in PvT. @Samro: Fair enough. I thought the distance should be longer for an attacker than a defender, and it would make that low ground base my preference for a third. Perhaps the issue then is something in the mid ground third, for me. It seems like Daybreak's third, which is pretty susceptible to DRG/Stephano style roach ling pressure, which has been forcing Protoss into 2 base all-ins recently. It would be a damn shame for a player to not want to take a third on this map, too, because it's attack paths are great for large armies and splitting for surrounds. About the drop pod, I like option 2 better. Option 1 makes it easier for an attacker to get on the ledge, but pretty much just as hard for a defender because of the long run around time. I think it's reasonable to expect infestors/other things that can deal with high ground that isn't reachable by ground by the time they take a fourth. @monitor and Samro re Rings: I'll work on something for the 5th bases. 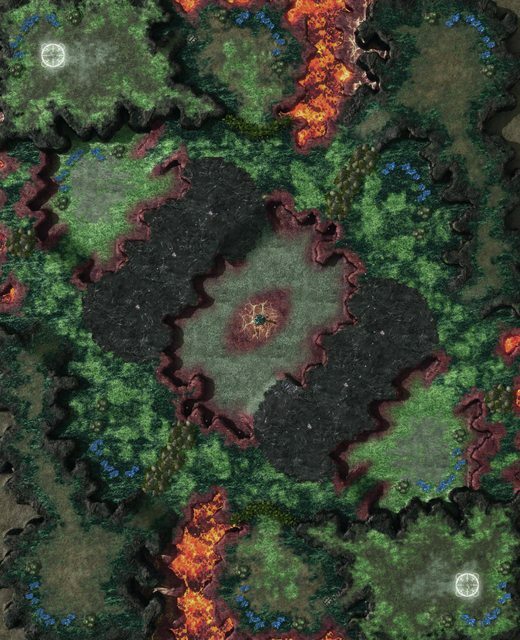 I do like island expansion dynamics, especially if there are creep tumors/destructible rocks to make it a little harder for terran. I will also look at restructuring the second entrance to the high ground expansion to make it more defensible. I'm a little worried about making the center taller because then each of the attack paths (center, around on either side) will be very far away from each other which is the problem that I had with the middle of Vorpal Shores. @Samro: I'm not sure what you mean by "Overall there are so many small features, i think you have to basically try to make one for each area and also make them stand out in the layout, but also in the texturing." Could you give some examples of small features? Do you mean something like the rocks and the LOS blockers or the cliffing or ? @Coppermantis re Rings: they are creep tumors as opposed to pre-placed creep, sorry about that. It was inspired by the ability to place permanent creep but I agree that that might be too strong, so I made it normal creep tumors so it would be destructible. The new versions of the Untitled contain a backdoor into the pocket 3rd, which is probably going to be a mineral wall. Since it's topographically symmetrical in both directions players will be able to expand as their 5th to either of the forward 3rds. There is no place where the XNTs grant vision range that can permit warping in or sieging. The purple lines are neutral creep. As for the Collected Works, the distance between the 3rd and 4th is not very great, and the choke immediately after the close ramp is only 4 ffs wide, making for a fairly easy to defend complex. Perhaps you missed this ramp? It's approximately the same ground distance between the third and the fourth as between the natural and the third. 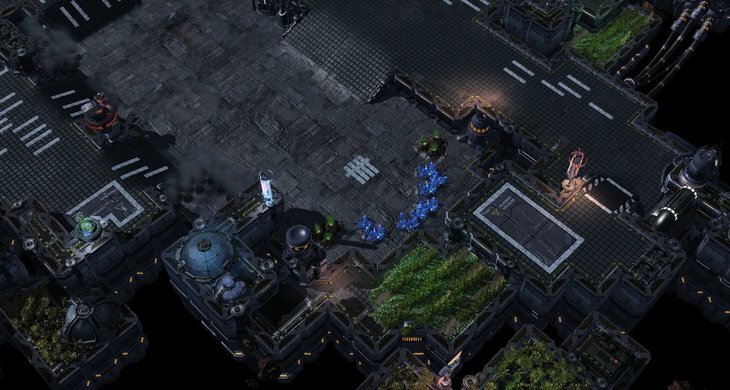 Right now Colossus and Reapers can only move in and out towards the third. I might, or might not change that. Because there are already 5 bases that clearly belong to each player, the golds exist simply to add some spice to the map. I expect them to be used mostly for ninja expands. Here's Rings with some updates. I moved the fifth and expanded the boundaries, but now there is a lot of dead space on the outside. Any suggestions on how to shift things to remove some of this empty space or is it not that big of a deal? The dark high ground outside the 5th is dropable. I'm also considering adding in a path from the high ground third to the natural, probably blocked by minerals or something. I've added more ramps to the center and widened existing ramps. I also shrank the lowground third's area so that it is still unable to be hit by tanks but is overall smaller. The Rocks will stay as they are for now, because without them FFE Would be near impossible with the two ingress points so far away. To remove them would require significant alteration to the natural, so I'll keep it for now. The naturals are pretty huge, other than that it looks pretty good. As much as I don't mind changing thread names, first impressions are indeed important. Redesign of Steppes of War. I've posted an earlier version of this in its own thread, but after stretching the center horizontally and added the center 6m1hyg bases, I don't know what to do with the middle. Any suggestions? Edit: Also, are the 6m1hyg bases in a good location, or would they be better in front of the 3rds (daybreak style) or in front of the naturals by the long arcs of doodads? - There is a backdoor in your main on a lower ground, think of what is there on Sanshorn Mist except with rocks leading to a small ramp in it. Breaking this provides easy access from a potential third to your main as well as of course being attacked by lings. It also serves as an entrance for reapers and colossi. - watchtower vision is crucial, not only do they guard attack paths, they also provide vision over LoS blockers meaning that if you hold the right tower you can shoot through it and your opponent can't. WCS Apartheid cometh, all hail the casual audience, death to merit and hard work. Not really sure this works, since the middle is small enough that the plateau in the middle would provide too much of an advantage for the attacker who controls it (high ground + tower vision) - this would be a problem especially in the late game when both players have taken the center bases. I think I might just keep the center as low ground and add some random doodad clumps to decrease the openness (kind of like my initial version but larger) - this would also make it more similar to the original Steppes of War. Problem is it is already the lowest cliff level, I think instead you should make it have Shakuras style high ground pods with many LoS just like original SoW. The LoS will help with making the area harder to hold (since an attack can come without noticing if you don't have vision on every corner. 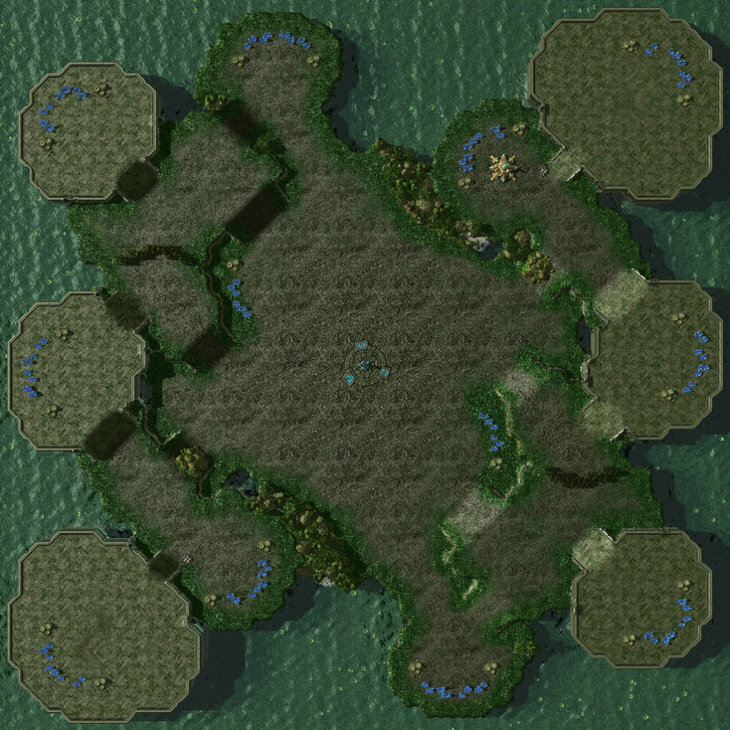 I would do a large doodad structure in the middle with a watchtower that prevents pathing straight through, but can be taken from both sides. 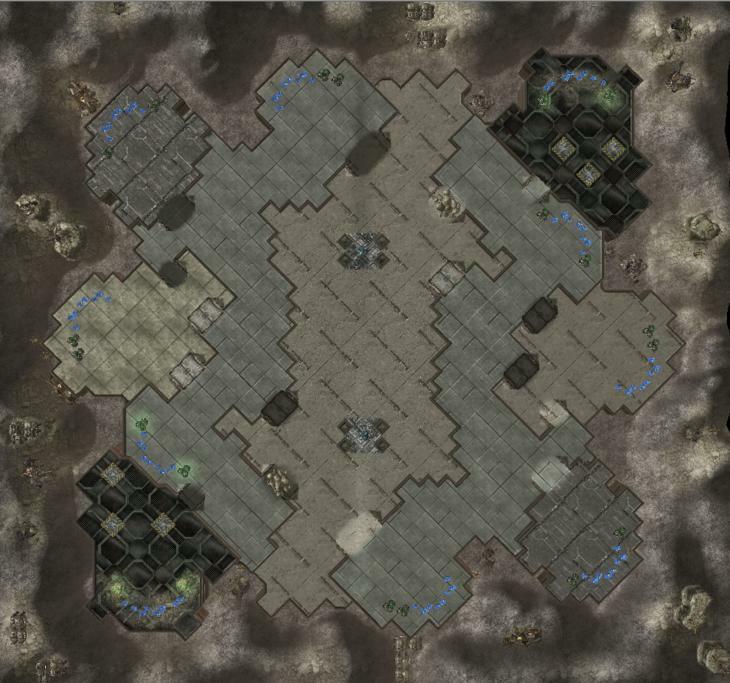 To give a bit more map presence for Terran and Protoss vs. Zerg mid-early game. I would then put two medium sized doodad structures. One to the north, and one to the south (about where those highgrounds you have now are). I would not put anything outside the natural ramp it feels too tight there already. I would also move the corner foruth base off the highground, and put it on the same level as the natural. Feels cramped up there, and I don't like the single ramp. My two cents, but do whatever obviously. Edit: Maybe some LOS too if you can squeeze them in somewhere. It is hard to comment on your map, because of the angle/size of the picture. Could you give a 90 degree overview?